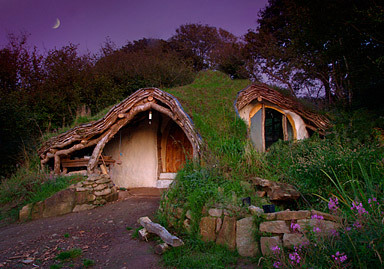 This is a house I built for our family in Wales. 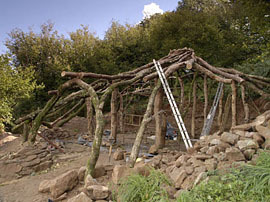 It was built by myself and my father in law with help from passers by and visiting friends. 4 months after starting we were moved in and cosy. 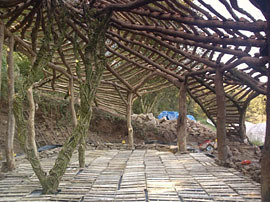 I estimated 1000-1500 man hours and £3000 in materials. Not really so much in house buying terms (roughly £60/sq m excluding labour). 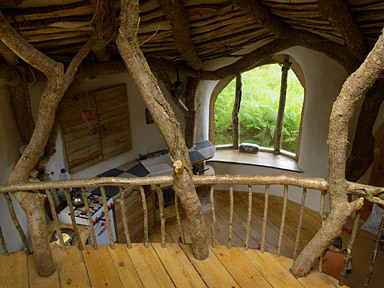 The house was built with maximum regard for the environment and by reciprocation gave us a unique opportunity to live close to nature. 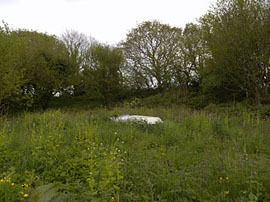 It housed our family whilst we worked in the woodland surrounding the house doing ecological woodland management and setting up a forest garden, things that would have been impossible had we had to pay a regular rent or mortgage. The main tools used were a chainsaw, hammer and 1 inch chisel, little else really. I was not a builder or carpenter, my experience was only having had a go at one similar house 2yrs before and a bit of mucking around inbetween. This kind of building is accessible to anyone. My main relevant skills were being able bodied, having self belief and perseverence and a mate or two to give a lift now and again. 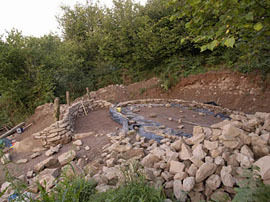 The site before starting Hole dug and level, post positions marked out, dry stone foundation walls down, first retaining wall built against front bank. 30 or so small trees and a bit of chainsawing later. Lift logs, prop up, nail together and continue until no longer wobbly. 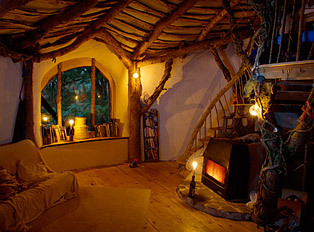 Split logs over the top and palettes on the floor. Tree in to prop up sleeping platform. Palettes on the floor to take insulating bales. Straw delivery. 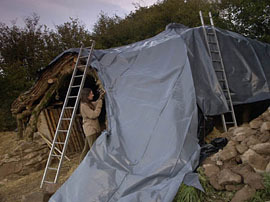 Cotton sheets then straw bales on the roof and cover it up with plastic, other bales inside, quick before it rains. 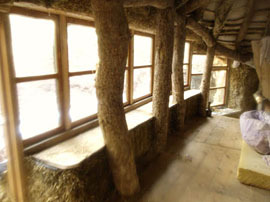 Build straw bale wall inside, a fun and quick job. The bales are stacked on rough dry stone wall and staked together with hazel sticks. Inside bales go on pallette floor ready for floorboards on top. 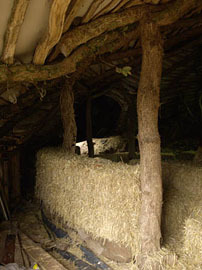 Pop windows in the holes, stuff straw into any gaps then chainsaw trim the bales smooth with cute roundy corners. 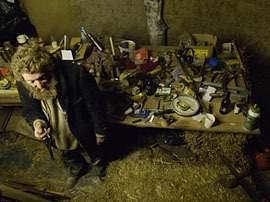 Father-in-law and tool bench, 4.30am. All tools lost, snowing outside, no doors, plastering underway. Aesthetic, low visibility and natural harmony. Lower embodied energy than sawn timber. On site,plentiful supply of otherwise useless oak thinnings (4"-9"). More efficient than open fire. 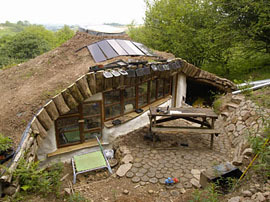 Low embodied energy natual byproduct. Protection from weather, animals and fire. 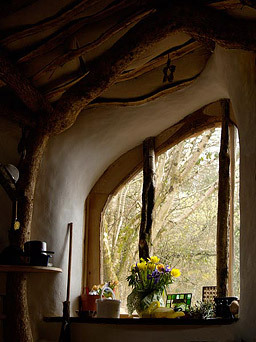 Use lime plaster where straw is above ground. Use airgap creating spacers and plastic where straw is against or under earth. NB. Ideally the design of our lives is seamless with integrated relations between all the spaces, activities and things with which we live. In this case however, mention is limited to that which comes inside the physical structure of the house to save unravelling the whole of the metaphorical woolly jumper.